With Charge Anywhere’s EZ EMV SDK, integrating EMV payments has never been easier. Integrate our PCI-secure payment solutions into your applications built specifically for mobile phones and POS systems. Enable payments for Android®, iOS® and Windows® Desktop operating systems. Integrate a secure payment form within your E-Commerce web application. Reduce the burden of security, development and regulatory compliance by using the integration toolkit to complete the payment. Integrate your solution with our PCI DSS Level 1 payment gateway and have instant integration with all the major credit, debit and ACH payment processors in the US and Canada. As part of our solutions, a test account in CHARGE Anywhere®’s Web Test environment is provided with the features listed below. 1. Submit request for sandbox account. 3. Complete integration using the documentation and tools provided. 4. Get certified by CHARGE Anywhere® and listed on our corporate web site as a solution provider. 5. Request transfer to production status. 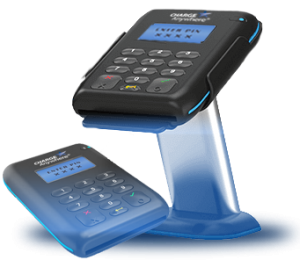 Starting on October 1, 2015, if a merchant swipes a chip card, the liability associated with credit card fraud will shift from the card issuer to the merchant unless the merchant has upgraded its card acceptance and processing systems to use chip-enabled devices and applications to process card transactions.